Chikungunya is caused by the chikungunya virus (CHIKV), an arthropod-borne virus (arbovirus). 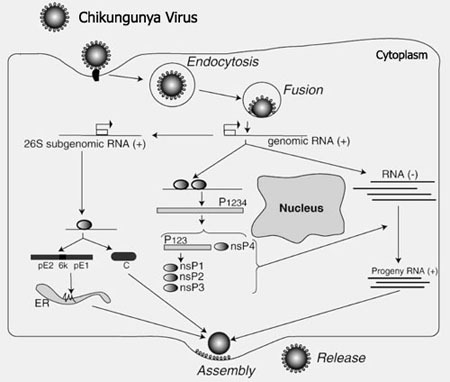 Chikungunya is a member of the Alphavirus genus in the family Togaviridae. There are 29 different types of alphaviruses that cause diseases in humans and other mammals. These species of arboviruses have been classified into 7 antigenic complexes: Barmah Forest (BF), Eastern equine encephalitis (EEE), Middelburg (MID), Ndumu (NDU), Semliki Forest (SF), Venezuelan equine encephalitis (VEE), and Western equine encephalitis (WEE). Alphaviruses can be divided into New World and Old World viruses. These two groups have evolved distinct ways of interacting with their respective hosts and differ in for instance their pathogenicity, and tropism. 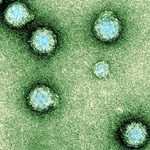 Chikungunya virus is part of the Semliki Forest SF group of Old World Alphaviruses. Predominantly New World viruses are associated with encephalitis, whereas poly-arthritis and a rash is predominantly associated with Old World alphaviruses. Although chikungunya virus is a member of the arthritogenic alphaviruses, there are also cases of meningoencephalitis and haemorrhagic disease (see also Signs & Symptoms). The Alphavirus genus includes besides Chikungunya virus also O'nyong'nyong virus (ONNV) and Ross River virus (RRV). Chikungunya and O’nyong nyong virus have 85% similarities in their genome. The O'nyong'nyong virus causes disease with symptoms very similar to chikungunya virus. It is also transmitted by mosquito's and the disease symptoms include arthritis, fever and rashes. This virus is so far limited to African countries mainly Uganda. It is not known to be fatal. The Ross River virus causes rashes and arthritis. This virus is epidemic in Australia and some of the surrounding islands. This virus is also transmitted by mosquitoes. 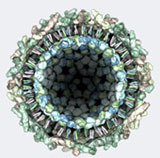 Chikungunya virus is a small (about 60–70 nm-diameter), spherical, enveloped, positive-strand RNA virus (see figure 1). Early 2006, the complete sequence of a chikungunya isolate from Reunion Island was made available through NCBI/ GenBank accession no. DQ443544.1. The virion consists of an envelope and a nucleocapsid. The chikungunya virus genome is 11,805 nucleotides long and encodes for two polyproteins – the non structural polyprotein consisting of four proteins (nsP1, nsP2, nsP3 and nsP4) and the structural polyprotein consisting of five proteins (Capsid, E3, E2, 6K and E1) (see figure 2). The 5’ end of the RNA molecule is capped with a 7-methylguanosine while the 3’ end is poly-adenylated. A subgenomic positive-strand RNA referred to as 26SRNA is transcribed from a negative-stranded RNA intermediate. This RNA serves as the mRNA for the synthesis of the viral structural proteins. Alphaviruses have conserved domains that play an important role in the regulation of viral RNA synthesis. These domains are found at the 5’ and 3’ ends as well as at the intergenic region. The E1 and E2 glycoproteins are expected to form heterodimers that associate as trimeric spikes on the viral surface covering the surface evenly. The envelope glycoproteins play a role in attachment to cells. Virions located on the surface of the cell membrane enter the host cells by fusion and endocytosis of the viral envelope. The uncoating of the virions occurs in the cytoplasm. The site of mRNA transcription is in the cell cytoplasm. Replication is not restricted to a particular tissue or organ of the host so the virus replication occurs in various organs. The insect host initiates the virus replication. The genome replication is done in the cytoplasm (see figure 3).